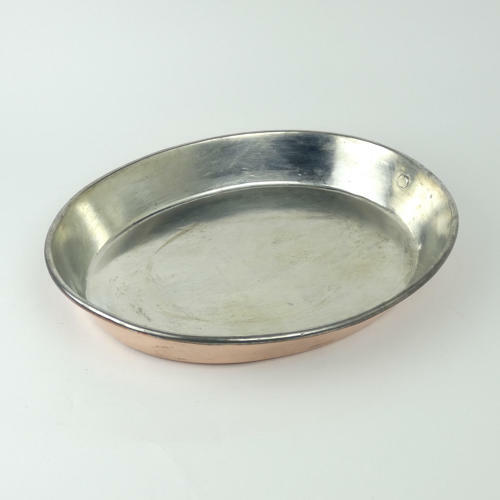 A large, Victorian, oval copper baking dish. This piece has a very interesting makers mark. On the fitting for the handle it is marked 'SOLLOMONS MAKERS WOLVERHAMPTON'. This is a mark that we haven't come across before. The piece is made from a heavy gauge of copper and it dates from c.1890. It has a simple, folding loop handle to one end, and the rim of the pan is rolled. There is marking to the copper, on the base of the pan, from use but otherwise it is in very good condition. The interior has been re-tinned so that it can be used. Price includes postage within the U.K. Shipping to the U.S.A. add £40. Western Europe add £15.